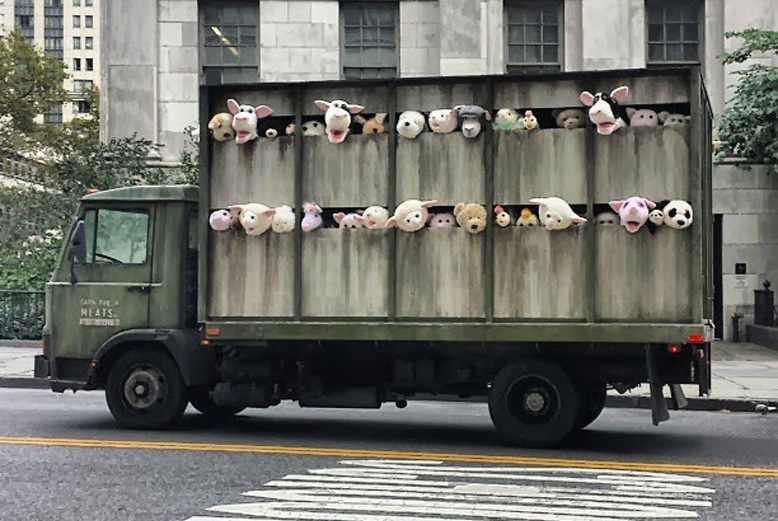 This brilliant bit of art in motion is a slaughterhouse delivery truck filled with adorable, cuddly soft animal toys, squealing through the narrow boards of the truck. True sounds made by real terrified factory farm animals on their way to slaughter. Is he making a statement about the cruelty in factory farming? Or is it a statement about the loss of childhood innocence? Either way, it is brilliant, and as a vegan, I choose to believe the statement he is making is about the inhumane abuse of factory farm animals for human consumption. After all, Banksy worked in a Butcher shop when he was younger…perhaps it had a lasting effect on him. This display on wheels will be “touring the meatpacking district and then citywide for the next two weeks,” according to the Banksy New York website. The “Sirens” video was has nearly 3-million views on YouTube as of today. Check it out here. The sculpture art will tour New York city for the next two weeks. It appropriately started in the meat-packing district. 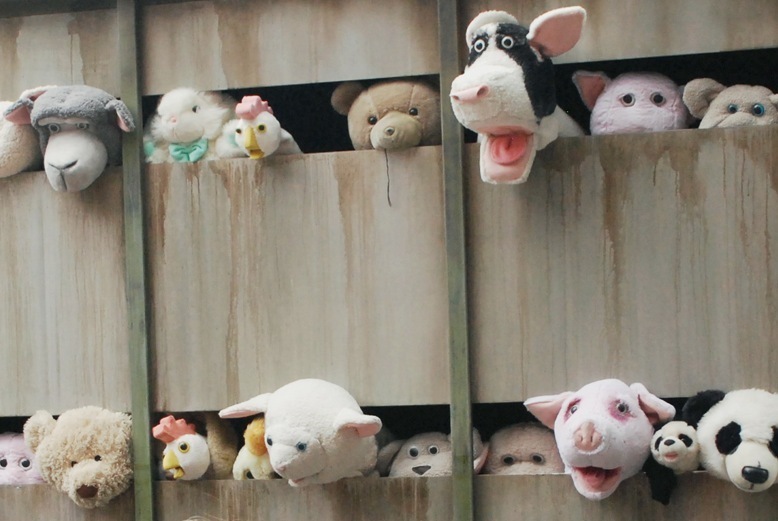 In order to run the slaughterhouse truck, there are four puppeteers dressed in black Lycra inside the truck, moving the toys, whose heads turn and mouths open and close. These are “60 cuddly soft toys on the road to swift death,” the website says. SoberVeganLesbian brief rant: F**CK! DA*MN! CRAP!! SERIOUSLY???? 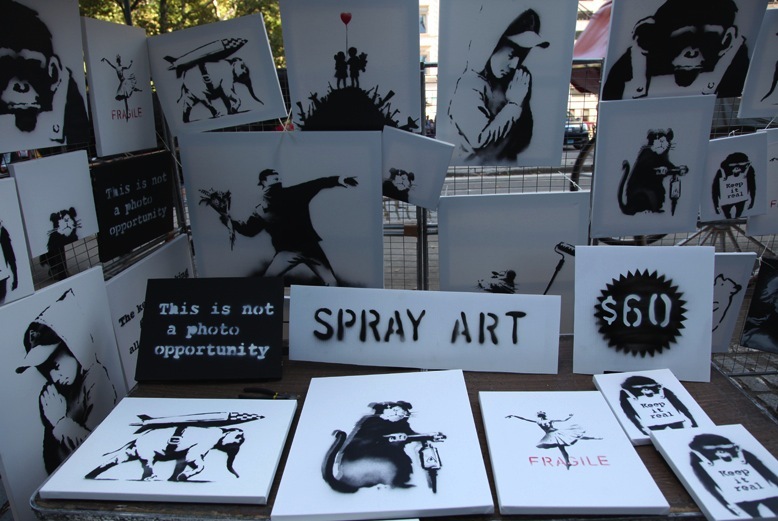 I can’t believe I am currently in Los Angeles and missing the Banksy visit to New York!!! I am seriously bummed out about this. I might be forever damaged! He also pulled a great one setting up a booth on the street selling his original, signed artwork for $60. Most of the unknowing passerby’s ignored the stand, thinking they were knock offs. But a few very lucky people made some purchases that could now be worth tens of thousands of dollars. Lucky bastards! Banksy, I would like to say thank you for your continued brilliance. You may not show that face of yours, but you have just shown what you are made of…..compassion. You are incredible, uber talented, and just plain awesome! ← V- Easy Meal For Those Who Don’t Cook.